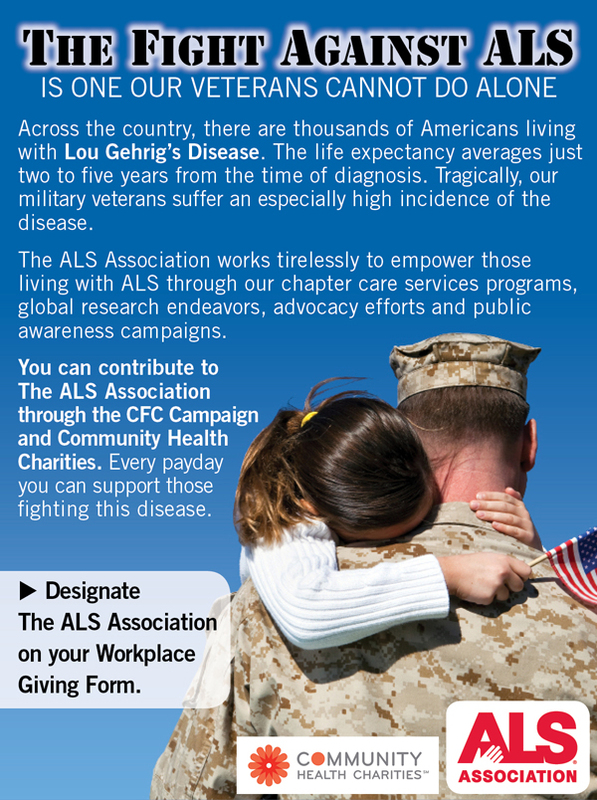 Workplace Giving is an easy way to support The ALS Association North Carolina Chapter. Studies have shown that military veterans are twice as likely to develop ALS as the general public. Your gift funds care service programs in North Carolina and nearly 140 research projects throughout the world. Giving at work through payroll deductions is simple, and there are many convenient ways to contribute. As a member of Community Health Charities (CHC), we are one of the voluntary health agencies participating in the Combined Federal Campaign (CFC) and the State Employees Combined Capaign (SECC). Federal government employees are encouraged to participate in the CFC and may designate The ALS Association North Carolina Chapter by writing 47633 on the Workplace Giving Form. State government employees are encouraged to participate in the SECC and may designate The ALS Association North Carolina Chapter by writing 1031 on the Workplace Giving Form. Call Holly Zahn at 1-877-568-4347 in our office for additional information or if you have questions. Even if your company isn't listed here, check with your Human Resources Department to see if you have a Matching Gifts Program. If you do, you will be given a form to complete. After you complete the form, send it to: 4 North Blount Street, Suite 200, Raleigh, NC 27601 or fax it to: 919-755-0910.